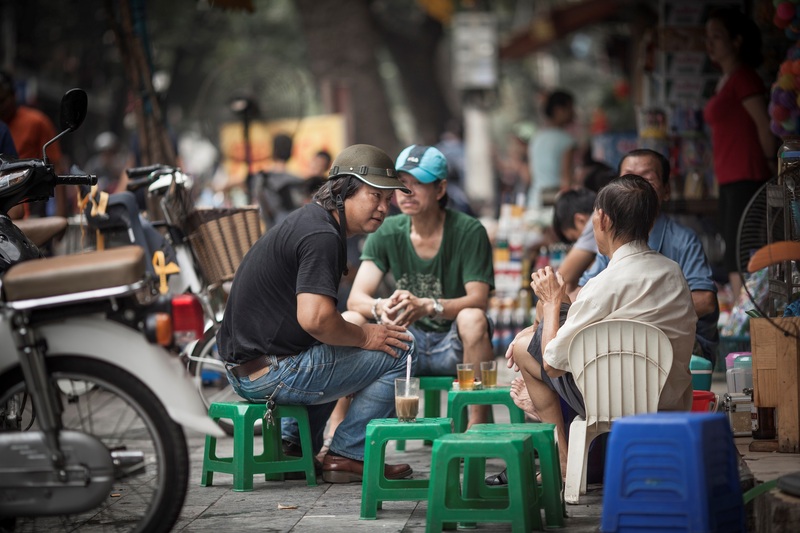 Hanoi is known for its nostalgic, one-word name cafés that have been open for decades. Though modern and well-decorated coffee shops grow like crazy in the city, none of them can replace the soul of Hanoi and these traditional meeting places. If you pass through Hanoi without visiting these cafés, you will not truly experience this great city. In the maze of the capital’s coffee shops, these cafés preserve the dust of historical values – dust that whispers of the casual life of this city more than any newspaper and museum. Such places still interest many people in todays’ culture and they have something unique: one-word names. The café’s name is usually the name of its owner. The café is not a commercial unit, rather a personal corner for its owner to welcome his guests. People refer to it as a “unique culture of Hanoi.” Let’s explore the streets to understand these “salons of culture”. 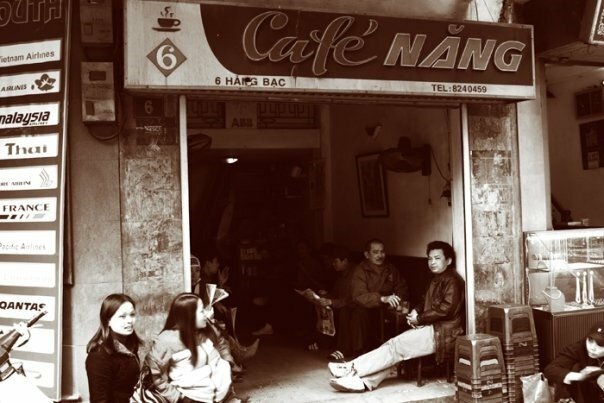 Established in 1946, Nhan Café was a secret gathering place for revolutionary soldiers during that time. Its three founders were also soldiers. They named their café “Nhan,” and while it is the name of one of the three founders, this word also means humanity. In several ways, Nhan Café played a role in building the independent Vietnam of today. When visiting this café, not many of the guests know of its tumultuous history, from its opening in 1946 to the calm café of today, it has passed through rough times moving from one place to another. Today, Nhan Café has branches in other areas of Hanoi. The first small shop on Hang Hanh Street is still the favorite of locals. Address: 37 Hang Hanh, Hoan Kiem, Hanoi. 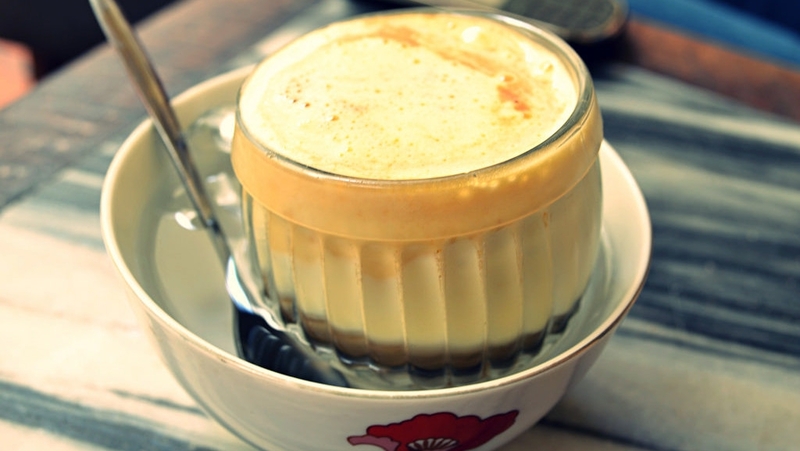 We know Giang because of its famously good egg coffee (you can read more about egg coffee in here). Have you ever wondered why this unique drink was created? 72 years ago, in 1946, after a long time working for Sofitel Metropole Hanoi Hotel, Mr. Giang hoped to bring the Cappuccino to more Vietnamese “coffee-holics”. Sadly, fresh milk was scarce at the time. After many tests, Mr. Giang thought of the egg yolk as an alternative ingredient, which also was a better match in flavor to the bitterness of the Robusta bean. This unique ingredient is exceptional, contributing to the unique fame of Hanoi coffee. Today, thanks to the electric whisk, the yolk becomes softer and the smell is less strong. It even makes cold egg coffee beautifully possible! Today, you can find Giang either on Yen Phu Street or on Nguyen Huu Huan Street. The original one on Nguyen Huu Huan Street, however, is still my most favorite. Upon entering Dinh, you will notice the portrait of a little girl hung on the wall. This is Ms. Bich, the daughter of the above Mr. Giang when she was young. In 1990, Ms. Bich, who had been an old, gentle lady, set up this small room in the old building with a view over Hoan Kiem Lake. Since then, Dinh is a common destination for the young Hanoian who likes the strong, cheerful rhythm of rock. Imagine passing through the mossy staircase entrance, crossing by several small doors older than a few decades, until you hear the hum echoing from the café room. Ms. Bich passed away last year, in 2017. Dinh doubled in size. The authentic taste is still maintained in this pleasant café and it passes to the next generation with every new visitor. Visit Dinh on a Sunday morning and find a peaceful seat on the small balcony, bask in the novelty of the early day, you will love it. If you are in the Old Quarter, don’t miss this café. A rustic ambiance with small stools and the mossy walls will take you to the time when the café opened 60 years ago. The café used to be a gathering point of Hanoian artists in its early days. Similar to traditional cafés of Hanoi, Nang offers you salted lime, I highly recommend if you want to try the taste of this city. You can find Nang in many places. However, the second floor in Hang Bac branch is perfect to enjoy your morning coffee. Lam is widely known for its invaluable collection of artwork. 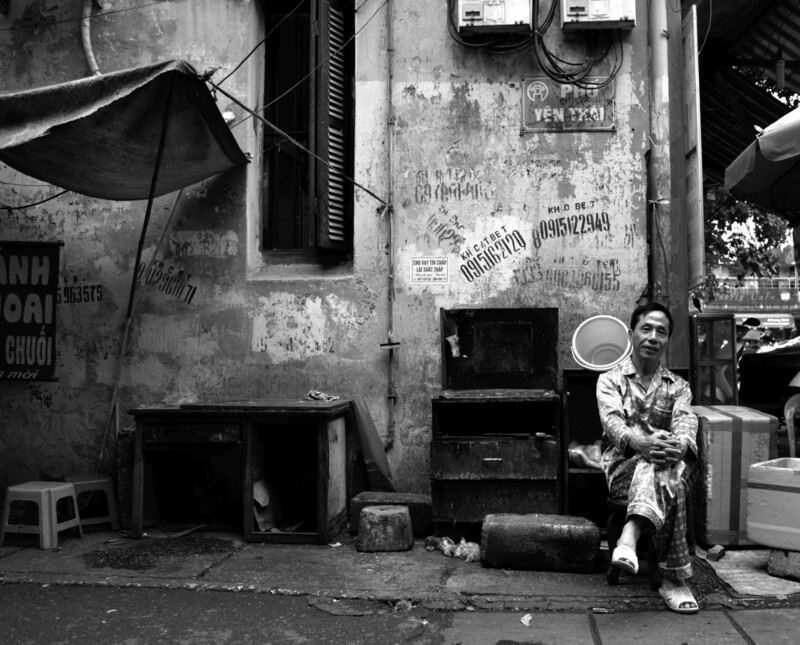 Mr. Lam moved to Hanoi from the countryside, his first coffee business was a sidewalk stall. Later in 1956, he bought the current house and opened the café there, where he spent the rest of his life living and working. The café opened during a historic period of Vietnam – when Vietnam’s independence was just announced and the unbelievable Dien Bien Phu Campaign ended. This was a golden time for artists to create and make incredible works of art. Lam Café, similar to several other cafés opened at that time, become a place for artists to gather. But it might be Mr. Lam’s love for art that really made his café a treasured collection of artwork. On its four walls, paintings collected from well-known Vietnamese artists glance down at guests. Many of these artists have time and time again passed by and had coffee at Lam. Even today, young artists still refer to Lam as an educational place to see. If you wish to see more of the paintings, you can kindly ask for permission from the owners to go into their living room, where the real gems of art are exhibited. The café is said to be a visual art institution rather than a coffee shop. But its coffee is excellent as well! Today, Lam Café still maintains its old interior with small wooden stools and tables, serving the old-style Vietnamese coffee. No one can explain why this old, tiny café stays busy day after day in the city of countless cafés. Some refer to the coffee’s hard bitterness as a reluctant explanation. Some refer to the easy-going atmosphere that customers create. You may have your own judgment. But Nhi is a hidden corner whispering in the small alleys of the capital. You don’t want to miss this experience if you are looking for something genuinely Hanoi. For 30 years, Tho has been the place to go for any Hanoian thinking of a cup of ice tea on Trieu Viet Vuong Street. This café was opened by brothers from a true Hanoi family. It has good drinks, a low price, and a simple yet joyful atmosphere. People love sitting on the sidewalk in front of the café, having coffee or yogurt with fermented rice and enjoying a sunny day on the weekend. No one can predict how these little corners will change in the coming years, even days. Some may develop into more trendy shops, some may close down. Mr. Lam once sadly confided that the bombing campaign in 1972 destroyed the city’s value less than what money is doing to Vietnam today. Take your time visiting these old cafés, so that you can feel Hanoi’s ancient beating heart.